When the summer 2013 transfer window closed a week ago, the 20 clubs of the Premier League had collectively spent £631,369,000 buying or hiring new players on a permanent basis, not including any players on loan or youth contracts. Sportingintelligence has assessed each club’s total spend and net spend as well as calculating the spending on players of different nationalities, ages and positions. As with any exercise that attempts to ascertain the correct prices paid, there will be inherent errors when official figures are not available. But official amounts are used wherever possible – and kudos to Everton and rare others for publishing that this summer – and the most reliable sources for each other deal have been used. All the graphs and tables below have been calculated from the detailed data within that. 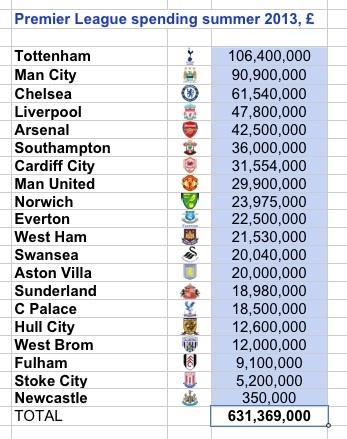 Each club’s deal-by-deal business can be seen within that spreadsheet. The highest gross spenders were Tottenham with £106.4m, followed by Manchester City on £90.9m then Chelsea and Liverpool, with Newcastle spending the least, £350,000 on a single teenager. When sales by clubs are taken into account, the spending picture looks considerably different. 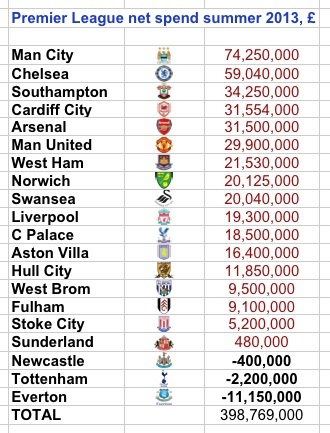 Tottenham sold players worth more than all those they bought, and they ended in net profit over the summer. But not as much profit as Everton, who had a profitable window to the tune of £11.15m, even after bringing in James McCarthy for £13m, Aroune Kone from Wigan for £6m and Joel Robles from Atletico while making the very decent loan signings of Romelu Lukaku and Gareth Barry. 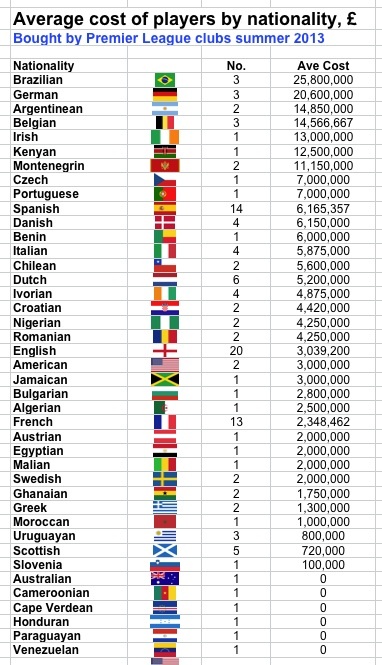 The most expensive players by nationality on average were Brazilians, with three of them costing £25.8m each on average. Germans were the next most expensive, again three of them, averaging £20.6m each, headlined by Mesut Ozil. Argentineans, Belgians, Irish, Kenyan and Montenegrin players all averaged more than £10m each, albeit from small sample pools. Fourteen Spaniards moved at an average cost of more than £6m each and the relatively low average cost of English players reflects the fact that most of those moving were very young or quite old. Ozil’s price tag of £42.5m boosted the average cost of 24-year-olds (10 of them) to £10.3m each. 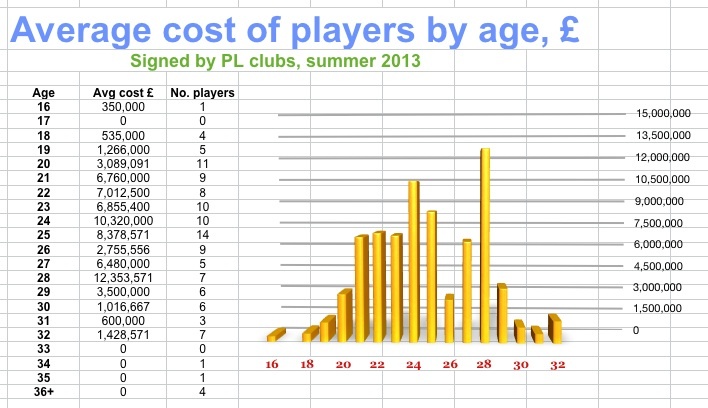 Only 28-year-olds cost more on average (seven of them at £12.3m each). The clubs combined signed 14 goalkeepers, 34 defenders, 36 midfielders and 37 strikers. The ‘goals bias’ of the attacking players, notably strikers but increasingly midfielders, meant those groups, on average, cost more than twice the price of defenders. When free players are discounted, paid-for defenders cost an average of £4m each, with midfielders on £8.5m each and strikers on £9.3m.